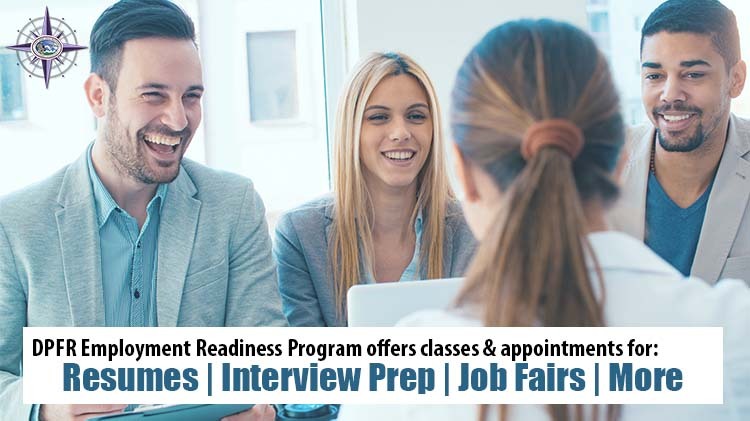 The Employment Readiness Program (ERP) offers resources to help with your career plan and job search. Our office proudly offers assistance to all Department of Defense ID Card Holders, to include: Military Spouses, Retirees, Veterans, Active Duty Service Members, DoD Civilians, Active Reserve, National Guard, and Wounded Warriors. Classes on career exploration, resume writing, interviewing techniques, and networking. Contact your Employment Readiness Program staff for more information. Looking to speak with an ERP office on another Installation? Contact information for installation ERPMs can be found at Army OneSource. Are you interested in learning how to make your resume more competetive? Not sure what career path you want to pursue? Need to prepare for the big interview? Sign up for an appointment with one of our career counselors and get that one-on-one attention. Just set up an appointment and we will take it from there! Employment Readiness is able to teach on a wide variety of employment related courses. Special subject courses can be set up upon request. Resume 101: Assists in preparing a current, effective resume; particular attention is paid to modernizing the resume & articulating value of the participants. Participants will leave with structured knowledge of how to compose a competitive resume which reflects their best qualities. Complete Federal Resume: Explore deeper into usajobs.gov and the Federal Resume. This course will teach participants the tricks and strategies of the job search and Federal Resume format. Find the latest on hiring events, job fairs, networking events, and other employment opportunities at JBLM Unlimited or JBLM DPFR. Join WorkSource on Wednesdays from 8:00 a.m. to 4:00 p.m. for full counseling services including resume, interview, job search, referrals, and more. Open to all military, spouses, veterans, retirees, and civilians. The Department of Defense established the Spouse Education Career Opportunities program to provide education and career guidance to military spouses worldwide, offering comprehensive resources and tools related to career exploration, education, training and licensing, employment readiness and career connections. The My Career Advancement Account (MyCAA) Scholarship Program is a workforce development program that provides up to $4,000 of financial assistance to eligible military spouses who are pursuing a license, certification or Associate’s degree in a portable career field and occupation. Visit MilitaryOneSource MyCAA for more information.